Nico Rosberg said he was “pissed off” with Mercedes Formula 1 teammate Lewis Hamilton making contact with him at the first corner. After Sebastian Vettel jumped into the lead, Hamilton was on the inside line into Turn 1 with Rosberg on the outside into the left-hander. 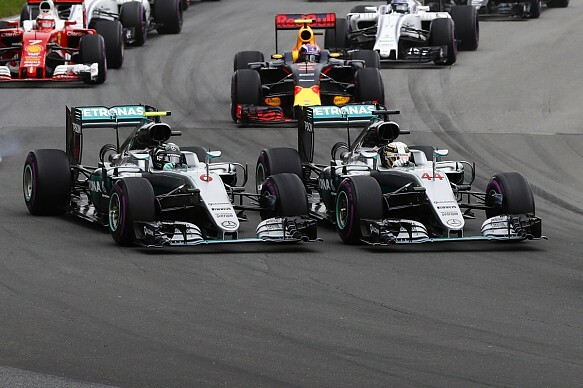 They continued round the corner but Hamilton understeered into Rosberg at the exit, forcing Rosberg to take to the runoff area and drop to ninth after rejoining. “Sebastian had a great start and I had a decent one and Lewis had a really bad one and my position was on the outside,” Rosberg told the UK’s Sky Sports F1. “In Barcelona, I gave it a go around the outside of Lewis and it worked out really well. I went for the same today and he did a really hard racing maneuver and we touched and I was off. Hamilton blamed a lack of front-end grip in the left-hander for the incident. Mercedes team boss Toto Wolff agreed it was a hard move by Hamilton and was disappointed with the ground that was lost as a result. “It was a hard maneuver,” said Wolff. “Lewis said that he had an understeer, [and] that’s what I would say. However, Wolff did add that the driver on the inside can dictate the corner.